What's interesting about this adaptation is that it simplifies but does not "open up" Tolstoy's narrative. Indeed, the author's prose occasionally seems more "cinematic" than Vidor's translation. One example (which occurs at the end of the movie and book, so skip ahead to the next paragraph if you don't want to know) is Andrey's death. Vidor and the other writers allow the prince's dialogue to replace much of Tolstoy's chilling and evocative description (some of which is interior to be sure, but much of which creates a sense of the room and its silences). Bondarchuk, I thought, went too far in the other direction, representing Andrey's hallucinatory dreams in bombastic detail. The scene requires a Bergman or Carlos Saura, a director schooled in evoking the terror of silences, the ache of a person slipping further and further away. 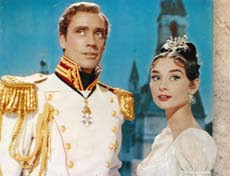 Another seeming example is the 1956 War and Peace's opening scene. Tolstoy begins with a lavish salon, multiple conversations unfolding simultaneously, characters wandering from pocket to pocket in a lavish set piece (Bondarchuk follows suit). Vidor's movie opens instead with Pierre and Natasha (characters who hardly interact in the first half of the book) leaning out of two different windows in the same house, watching troops pass on the street below. I say "seeming" because at first blush this conception could seem to oversimplify, and perhaps lose the potential visual richness of Tolstoy's conception. This was my initial reaction, though I did find the scene charming in its oversimplification of the book's opening - refreshing in its lack of fidelity to the source after so much concern with how rigorously Bondarchuk interacted with Tolstoy. Only afterwards did I reflect that simplification is often the essence of cinema. Think of the clarity of Hitchcock which Truffaut so rightly celebrated. Indeed, Vidor's scene may be more cinematic than the bustling, busy alternative. Despite its epic proclivities, the medium is most evocative and effective when it cuts like a razor to the essence of the thing. Complexity can be tempting (and sometimes rewarding) but Vidor was a great director who knew that streamlining also has its virtues on the screen. There's a classical purity to his adaptation which produces immense pleasure (at least initially). Yet Tolstoy's wild, lurching narrative ultimately proves untameable. The film, in attempting fidelity on the one hand and trying to cut to the essence on the other, is caught between a rock and a hard place. There are so many detours, ups and downs, and asides in Tolstoy's (and hence the film's) conclusion that Vidor's earlier simplifications, which prepare us for a more straightforward story, stunt our enjoyment of the movie's later passages, which do wander and require a willingness to stray from a clear line. There's irony in a comparison of the movies in this regard. I found Bondarchuk's version difficult in the early portions; it was hard to get a fix on and become engaged. But this paid off later, giving the viewer room to appreciate the movie as it meandered and giving the film room to devote itself to whatever was at hand. The early sequences of Vidor's War and Peace are the best and most effective in the whole film, but as such, they undercut the rest of the movie. Still, War and Peace has its charms. Chief among them is Audrey Hepburn, a dream come true as Natasha. One of the great, plaintive heroines of literature - the bewitching innocent who grows from girl to woman - gets to be played by the greatest female movie star, one who also had that innocence and plaintiveness in spades. Rarely do the stars - literal and metaphorical - align so perfectly. In other words, both Audrey and Natasha are heartbreakers. Henry Fonda is also good as Pierre, though he would seem too old and too slender for the part. Bondarchuk played Pierre himself in his own version, but while he looked the part I thought his portrayal played up Pierre's fecklessness at the expense of his bearish pent-up power and emotional intensity. Fonda captures the intensity if not the bearlike qualities, and whereas Andrey seemed to be the hero in the Russian version, Pierre is front and center here (though in both films, most of his plotlines are cut). As for Andrey, Mel Ferrer cuts a dashing and more charming figure than Vyacheslav Tikhonov, who was slightly sour in the part. But Ferrer lacks that brooding quality that made Andrey so compelling, and he doesn't hold our interest as much as he should. Finally, a word on the battle scenes. Coming in, I was certain that Bondarchuk's mind-blowing staging could not be topped. In a sense I was correct. The visual sweep and sheer scale of the later film are not matched here. But Vidor does something else, equally valuable. He clarifies and focuses the scenes of war (particularly the battle of Borodino near the end), giving them an emotional core and a sense of logic. If Bondarchuk captured war's chaos, Vidor beautifully captures its order, and hence some of the eagle-eye scale which Tolstoy brought to his own prose. Vidor centers the action on Pierre, an outsider on the battlefield, guiding us from behind him (his head anchors many early long, wide shots) as he wanders. With him we take in the full sweep of the hillside as the troops approach one another in the distance. Eventually he will be submerged in the action, but by starting with this remove, and clearly focusing on a single point of view, Vidor displays a typically American understanding of how the viewer engages with a scene, and the result is extremely satisfying. Hence, as the soldiers march towards each other in firm, crisp lines I was more awakened to the horrors of 19th century war - the terror of knowing you are to die in a fixed, orderly, inevitable way - than I had been by all the carnage in Bondarchuk's film. When it goes for the epic effect, Vidor's film does not meet Bondarchuk's challenge. Nor is he able to precisely nail all the moments of intimacy between characters. (Despite Hepburn's presence, the second part of the movie, focusing on her character, is less focused or effective than in Bondarchuk's film, where it felt like it could be its own movie.) Yet Vidor gives us greater access to the world of the story, feels more attuned to the particularities of screen narrative and, it's worth mentioning, features outstanding photography by Jack Cardiff. As I wrote about The Barefoot Contessa, Cardiff's Technicolor work contains a dynamic richness more typical of black and white. The best way to describe his vision is "luminescent darkness" in which shadows somehow pop as much as the foreground (that blue twilit skies make up the backgrounds of so many scenes is no accident). Anyway, both movies have their virtues and taken together, they represent different ways of seeing, not just a particular book, but also the medium and the world itself. As such, both are worth seeing themselves.